There are few things that take me to that Summer State of Mind like Sea-Glass. I use it all over the house to decorate for Summer. Just wrap the floral ring with ribbon and adhere with hot glue. Then position your sea glass stacking some on top of the other. But I like the tiny wreath the best! I’ve never heard of sea glass. This is beautiful! I hadn’t heard of sea glass either. It’s very pretty and I love your wreaths. 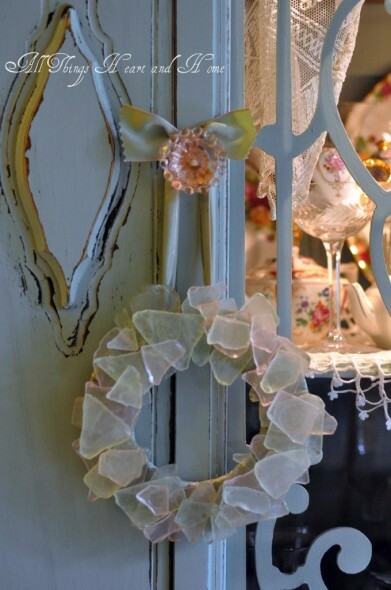 Beautiful Sea Glass Wreaths. 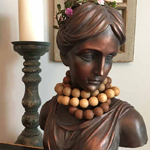 Something beautiful and fun to make and at a reasonable cost too. I agree, even the man made sea glass has a fairytale quality. 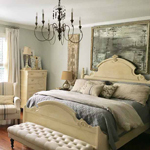 .-= m´s last blog ..La Nouvelle Orleans ~ This City is in My Heart! =-. .-= Eileen´s last blog ..Red, White and Blue =-. 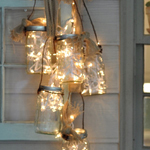 Ohhhh, I saw this and instantly thought what a great sun catcher for the window. I can just imagine it with the sun streaming through. Such a clever and unique idea. I admit I thought at first you were going to say you brought all of this glass from the beach… ha ha… silly me. .-= Vicky´s last blog ..When it doesn’t all add up… =-. you are just SO smart, young lady! the art that could be created? .-= prairiegirl´s last blog .. =-. I love this idea. Thanks for sharing. Visiting from TCB. .-= Diana´s last blog ..Number Three’s Baby Blessing =-. 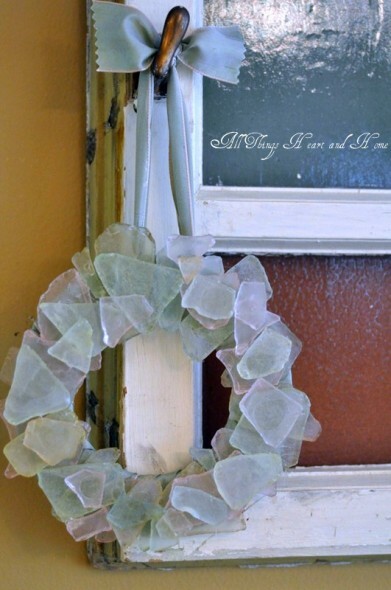 I am an Arizonan, and rarely get to see the beautiful beach, but sometimes we get the neatest finds at yard sales…I have a bowl of sea glass that sits on the granite above our toilet…I love your wreath idea…the colors are so gentle and soothing. Now, I am out to find more sea glass, whether on a table in someone’s Arizona yard, or near the ocean. Thanks for the wonderful idea! 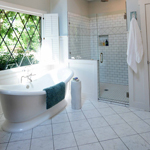 .-= Suzanne Rice´s last blog ..June First: A New Month and A New Plan =-. How neat is that, your wreath is just awesome! I am happy I found my way to your blog! Beautiful wreaths. 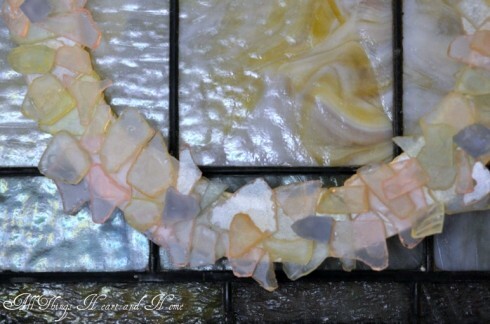 I’ve never heard of sea-glass, but it is very pretty. 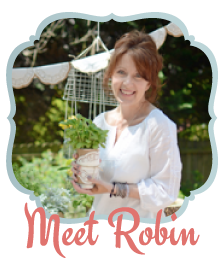 I came to visit from our party at Shabby Chic, and I’m glad I did — your blog is fab! I think your wreath would go great with my bronzed sea stars, too. I’ve been planning to cover an old set of windchimes with sea glass, and you’ve convinced me that I’m on the right track; will see what I can do this weekend…. Thank you! 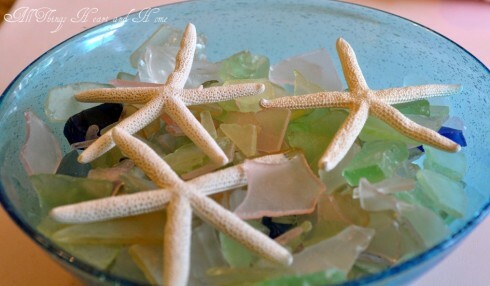 Now I know what to do with all of the beach glass we’ve collected through the years. It’s just not fun looking at them in jars. This is much more fun! .-= Sarah´s last blog ..Think Pink! 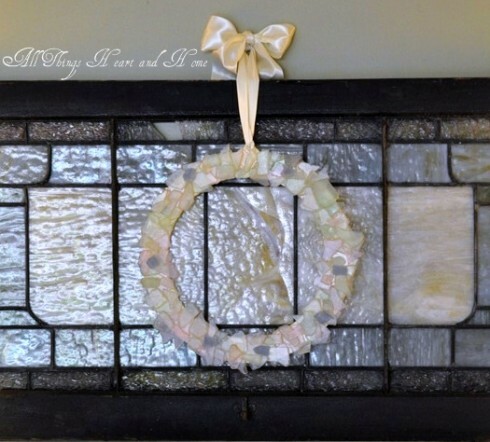 One wreath for all seasons (a mini tute) =-. i love sea glass. i look for it whenever i go to the beach. the blue sea glass is the hardest of all to find. what a wonderful craft to do with the magical gems. 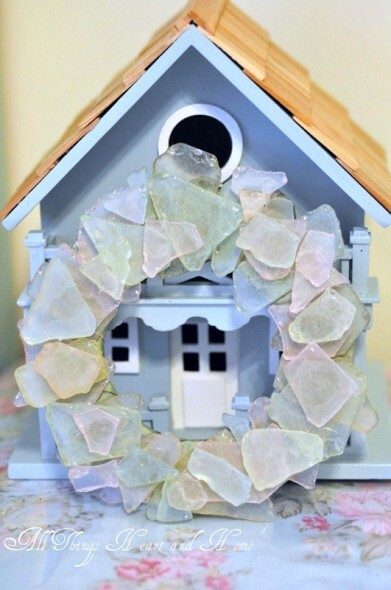 Your seaglass wreath is so pretty, I love how delicate and sweet it looks! 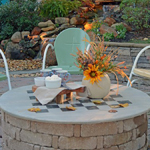 .-= Flowershopgurl´s last blog ..Grab A Seat At My "Tweet" Table ~ Sunday Favorites… =-. What a wonderful idea and executed so brilliantly! .-= LandlockedSheller´s last blog ..A favorite in our collection… =-. 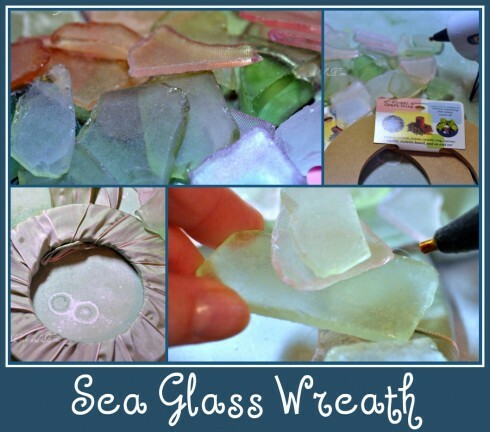 I LOVE seaglass ! I have a small collection that i have found on the beach. The wreath is a great idea. veronica from n.c.